First you have to congratulate the site! Congratulations! 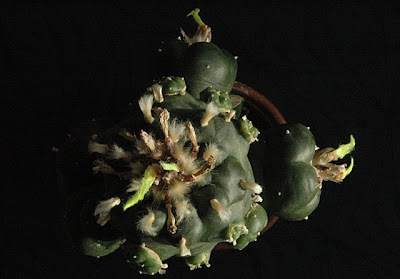 I am Brazilian (Rio), and I have a small but select collection of cactus and succulent with difficulties that remain - no longer get the cacti that are part of my wish-list (Lophophora williamsii, T. Pachanoi, Ariocarpus, Titanopsis calcarea, Dioscorea elephantipes, Aporocactus Flagelliformis, ..., ...., ....) - I am trying to appeal to the seeds .... Currently I have some seeds sprouting ... Problem is the expected growth. Hey there! Wonderful site! I've recently purchased some L.w's, ranging from little 2.5cm guys, to a couple 5.5cm more matures, with beautiful root structures, and one 7.5 beauty with two pups poking their little heads out. My question is about potting and watering. As it is winter now *I live in a pretty winter-less climate, never gets below 50F, and I read that you said to let the bare roots dry for a few days, and then pot in completely dry soil mix. I will bake the soil mix. I want to know how often to water them, if its variable based on plant size, and how young is too young to cut and replant a cutting? 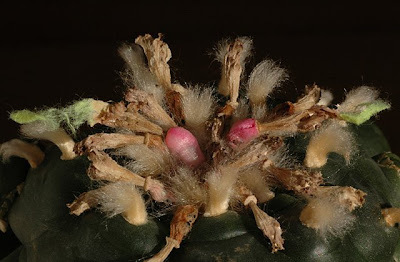 Any other information would be helpful too, as I'm not really well versed in the cactus world! Thank you! My plants are kept completely dormant during winter because of both temperature and light levels. 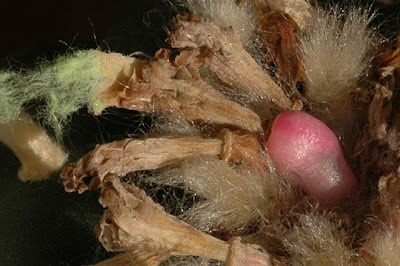 If the temperature is too low and you water your plants excessively they'll rot. If the light levels are too low and you keep your plants growing they will etiolate. The larger plants can easily survive a winter without water but seedlings and smaller plants are watered lightly a couple of times during winter (except the ones in my coldhouse that are kept bone dry all during winter). In the growing season I water the plants quite freely - make sure to use soil with good drainage and let it dry out completely between waterings. 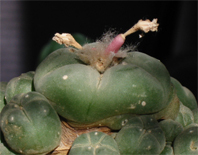 Regarding cuttings you might be lucky to root even very small seedlings (check out http://groups.google.com/group/lophophora/browse_thread/thread/82c0ee3aada36fef) but in general I would say you'll have better luck using larger cuttings as they need to callus (the cut surface must dry out) before being rooted. Personally I mostly propagate plants from cuttings if I'm forced to, e.g. 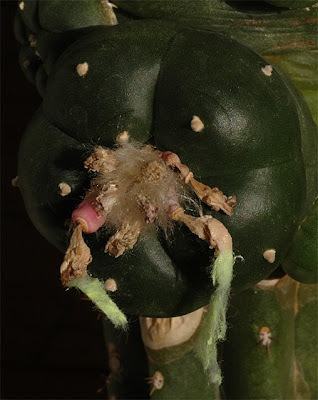 if a graft fails (or if somebody offers me a cutting from a rare plant ;-). I prefer letting my plants grow large (you also minimize the risk of infections by not cutting the plants) and start new ones from seed. Good luck with your plants and happy growing.